An exceptional example of the state-purchased leg–this one belonged to Samuel Clark, who was unable to wear it comfortably. On January 23, 1866, the General Assembly passed a resolution asking Governor Jonathan Worth to contract with a manufacturer of artificial limbs to fulfill the needs of the state’s Confederate amputees. North Carolina thus became the first of the former Confederate states to offer artificial limbs to amputees. The state contracted with Jewett’s Patent Leg Company, and a temporary factory was set up in Raleigh. A system was developed whereby the amputees encountered no out-of-pocket expenses in visiting Raleigh for prosthetic fittings. During the five years that the state operated the artificial limbs program, 1,550 Confederate veterans contacted the state for help. According to records in the State Archives, the total cost of the artificial-limbs program to the state was over eighty-one thousand dollars. After defeat, the loss of thousands of lives, and economic ruin, the state’s citizens still had the ability to achieve something noble by repaying, to a degree, those who had literally risked life and limb. There is a Jewett leg on display in the visitor’s center at Bentonville Battlefield in Four Oaks. 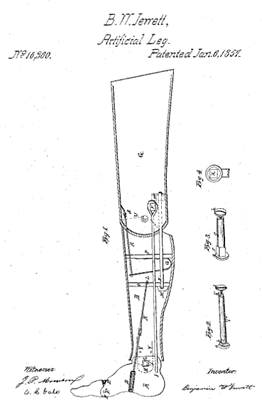 Samuel Clark’s 1866 leg. It is currently on display at the N.C. Museum of History. There are two Jewett legs that are on display in North Carolina. One is in the visitor’s center at Bentonville Battlefield in Four Oaks. Another is on loan for the new exhibit called North Carolina and the Civil War: The Raging Storm, 1863, which just opened at the North Carolina Museum of History in Raleigh. The Saluda Grade, Steepest Mainline Rail Grade in the U.S.
A circa postcard showing a train climbing the Saluda Grade. Image from N.C. State Historic Sites. On July 4, 1878, the first train to travel the Saluda Grade railway passage arrived in what’s now the town of Saluda in Polk County. Construction of the railway passage began in 1877 under the direction of Capt. Charles W. Pearson. The railway was intended to link Salisbury, Murphy and Knoxville, Tennessee, and most importantly to provide a connection between Asheville and Spartanburg, South Carolina. While railroad builders used tunnels to snake through the steep climbs found elsewhere in the North Carolina mountains, near Saluda they decided to the face the steep inclines head-on and built straight up the rugged terrain. The engineering feat that made the project possible was unprecedented in the 1870s, and construction proved so dangerous and resulted in so many causalities that it sparked an investigation by the General Assembly. Until taken out of service by Norfolk Southern in 2001, the Saluda Grade was the steepest operating mainline grade in the United States, with a 4.7% grade. Throughout the passage’s long history, it was famous for its high number of runaway train accidents. Visit: the N.C. Transportation Museum in Spencer showcases our state’s transportation history and offers train rides for visitors throughout the year.